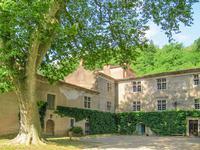 The Chateau is located in the valley of the River Garonne with wonderful open views to the surrounding mountains. 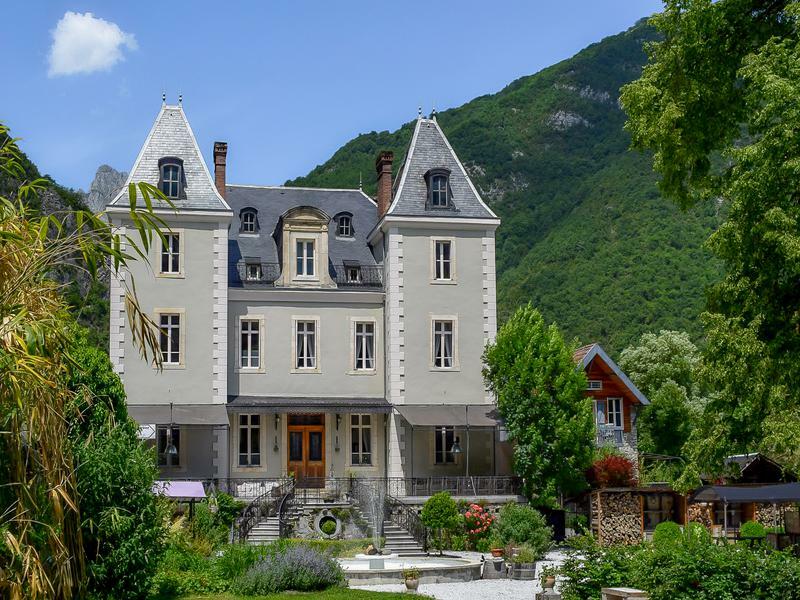 It is ideal for accessing the entire range of activities on offer in this stunning region (skiing, rafting, walking, cycling, fishing, climbing, golf, horse-riding. spas etc). 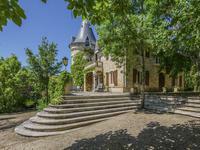 This lovely renovated chateau is set in its own grounds and offers many possibilities from a beautiful family home to a multi-functional hospitality business. The main renovation work was completed over two years 2008 – 2009 and the roof and exterior walls in 2013. 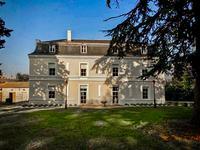 Currently a family home and Maison d’Hotes. The chateau has fuel-efficient pellet central heating, installed in 2014 and a micro-station 30 EH draining system installed in 2015. The north wall has additional insulation and the interior floors are all insulated to prevent noise between floors. 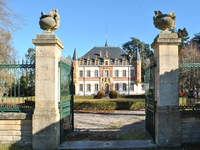 All the north, east and west facing windows are double-glazed but the owners have retained the beautiful original stained glass south facing windows to keep the character of the chateau. The large entrance hallway has mosaic tiles, half-timbered walls and ceiling decoration. There are two openings – one for the bar and another for the reception area. Large wooden doors enter the lounge on one side and the dining room on the other. There is a lovely washroom (wash basin and WC) just off the entrance hall with disabled access. The family living room with ornate ceiling rose, marble fireplace with insert fire, parquet flooring and a door giving access to the mini kitchen/bar and one to the reception area. · Office (11 m2) with parquet floor, marble fireplace, wood burning stove and a widow overlooking the terrace and the garden. · Bedroom (18 m2) with original wooden floor, marble fireplace and a private shower room (WC, shower cubical, 2 wash basins, tiled floor and mosaic tiled walls). This stunning room has parquet floor, large fireplace (wood and tiles) with a wood burning stove, 3 bay windows with ornate stained glass and beautiful ceilings. There is a small dining room of 12 m2 and a door leads into the massage room again with parquet floor. Steps from the dining room lead into the professionally equipped kitchen. 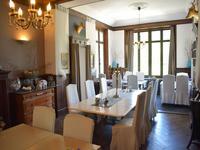 This room was developed for a restaurant business and is used for the guest suppers. A door to the right leads into this utility room with plunge, professional dishwasher, workbenches, cabinets, ironing machine and tiled floor with one wall completely tiled. There is a storage area measuring 6m2, a boiler room and a service entrance leading out to the road for deliveries. 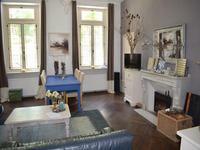 This apartment has 2 bedrooms (sleeping 4 guests) and a living room (lounge and dining area) with original wooden floor, beautiful marble fireplace and lovely bay windows. There is a separate fully equipped kitchen. There is a large bathroom with WC, 2 large wash basins set in wooden furniture, luxury shower/bath (jets/spa), tiled walls, wooden floor and window overlooking the garden. 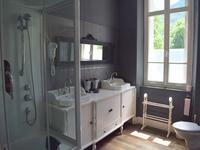 The suite has two bedrooms (4 people) with a shower room (WC, washbasin set in wooden furniture and a large shower). This lovely space has a bedroom (2 people) with a bathroom (double sink, shower, bath and WC) and can be extended with an extra room for 2 people. ·	Large living room (lounge/dining area) with new wooden floor and exposed beams. A lovely large B&B room with bed and a lounge/dining area. This room has a new wooden floor, exposed beams, small dressing area and a shower room (shower, WC, wash basin). 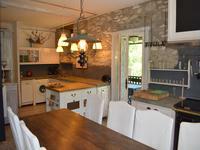 Hout sleeps 5 and has a bedroom overlooking the garden with a little coffee area and a new wooden floor. The bathroom has a bath, wash basin, shower cubical and WC). There is a separate equipped kitchen/dining room with a new wooden floor and a lounge (again with new wooden floor) with marble fireplace which overlooks the garden. A second bedroom with 3 single beds. This area has its own entrance and windows. 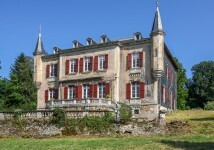 This is a large spacious house adjacent to the chateau that sits along a small stream and has central heating (connected to the chateau). 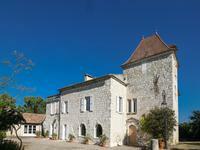 Between the chateau and the gite is a small room with an energy-efficient 300 litre water heater. The wall to the north has additional insulation. The roof has been renewed and insulated in 2017. Private parking area with shelter for 3 cars. There is a very nice large kitchen/dining room with a Hergom stove (like an Aga) which is connected to the central heating. The kitchen has lovely units, a washing machine, dishwasher, fridge/freezer, induction hob. 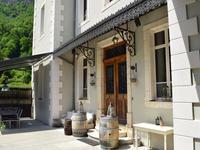 There is a large covered terrace overlooking the separate enclosed garden for the gite and the stream with decking and a great view of the mountains. 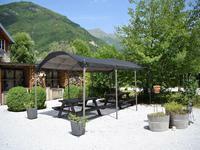 At the side of the garden is a lovely hidden seating area for apéro!! 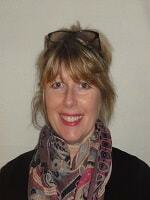 next to the stream – it is super. At the other side of the kitchen is a second terrace and garden which is south facing. Patio doors open onto the terrace. To the right is a bathroom with a luxury spa/shower/bath and two wash basins. To the left is a large bedroom – is it lovely and cool in hot summers. The lovely wooden staircase leads up from the ground floor directly into the living area which has a new wooden floor. This is a super room with high ceiling, exposed stone walls, patio doors out on to the little south-facing balcony overlooking the garden. There is a little corner office and a door into the hallway. The room has one wall of cupboards with ample storage, is south-facing and the windows are original stained glass from the Chateau. The bathroom has a bath, WC, shower (with jet sprays), tiled floor and 2 separate wash basins. 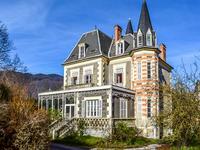 This wonderful Chateau is being sold as a home with a successful B&B business (accommodation and evening meals) with a turnover of approximately 80,000 euros. But equally it could be just a beautiful family home or much more and the business could very easily be expanded to include for example weddings, conferences, a full restaurant. 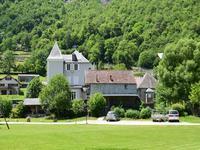 The unique location in the valley (near the Val d’Aran in Spain) offers year-round guests being located on the route from France into Spain. 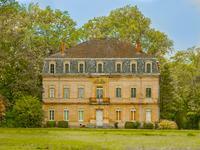 If you are interested in the Chateau, please contact me for more photographs and a viewing appointment.